For those of you still celebrating the New Year, here’s a recipe from Apartment Therapy/thekitchn.com that will send the old mimosa packing like last year’s hemline. Basically a simmered simple syrup of honey, lemon zest and whole spices including cinnamon sticks and star anise. A bit of the spiced simple syrup concoction, a splash of fresh orange juice (I used Meyer lemons for both the juice and the zest), topped with your favorite sparkler (Prosecco here). A more sophisticated flavor profile than your traditional mimosa, but still an excellent brunch beverage. The spices are subtle but don’t get lost in the juice. 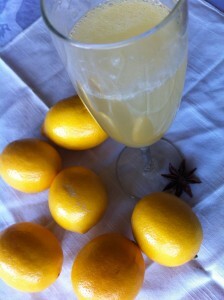 I first used Meyer lemons in place of both the regular lemon (zest) and orange juice, as I prefer a tarter drink. I did a sample with the orange juice, too (just for comparison). I actually like it both ways, but they are two very different drinks. The Meyer Spiced Citrus is tarter, and I think you get the hit of the spices in a slightly more pronounced way. The OJ Spiced Citrus really brings out the honey notes from the simple syrup. Both are well worth tasting and completely delicious. I love this drink. Thanks to the folks at The Kitchn for introducing me to what may be my new favorite brunch beverage!